Well, good morning! I'm always one of the first ones to get to the Down South Cafe. I've been an early riser all my life. In fact, I was one of the first ones to get to the cafe when it was Lou's Joint too, but it wasn't as pleasant then. Lou Lou...well, goodness gracious, she could be an ornery thing...rest her soul. I don't like to speak ill of the dead. But I'm not one of those people who act like they thought the world of somebody just because they died either. If I don't like you when you're living, I'm not going to change my opinion of you when you're dead. Anyway, I come in first thing every morning and order breakfast. And with my breakfast, I get an extra biscuit for my little friend the raccoon. This raccoon comes down out of the woods every evening about sunset and waits on my back porch for his biscuit. If, for some reason, I don't have a biscuit to give him that day, he'll take a shortbread cookie or one of those vanilla creme cookies, but he doesn't like those as well as he does his biscuit. You can see the disappointment on his little masked face. He doesn't have much of a sweet tooth, I reckon. I've always liked animals, but I never wanted any pets. I didn't want to have to take care of anything other than myself, especially after my husband died. But, wouldn't you know it? Now I'm stuck feeding a raccoon every day. And if he's late, I worry about him because he's usually like clockwork. I look forward to his visits now, and sometimes I'll even talk to him. So, do you think I'm a crazy old lady? If you were in my shoes, would you feed the little beggar? Or would you call animal control? Gayle Leeson, a pseudonym for Gayle Trent/Amanda Lee, is giving away a signed paperback copy of The Calamity Cafe. To enter the giveaway, please comment below before Monday, August 15. A winner will be chosen using the random number generator on that date. U.S. readers will win the paperback, and international readers will be awarded a digital (Kindle or Nook--your choice) copy of the book. Good luck! I'd feed him. Thanks for the giveaway. You're not crazy at all! Maybe you should get a few extra to keep in the freezer! Thanks for the chance to win! What a fun sounding book! I would definitely continue to feed the little guy. Feed him, Sounds like a great read. Thanks for the chance to win. I'd feed the critter. I'd also be the one who'd put out a salt lick for the deer in the wintertime and probably also arrange for food to be available on the property. My son's in-laws own acreage in upstate NY and we see the doe's walking with their babies across the back wooded area. Oooooooooooooops forgot to add email addie. NoraAdrienne (at) gmail (dot) com and yes I'd love to win a signed book. I'm a lover of all animals---so he's be welcome at my house. I'd bake to biscuits for him. I love this! I'd probably feed him if he seemed sweet like that, although raccoons aren't typically very nice. At least not around here... I definitely have to read this book! Thanks for the chance to win, signed books always mean a little more to me. squirrels but haven't had any other exotic animals around. The raccoon thanks you for the food. Interesting post. I have this book on my wishlist, since I really enjoy your other books. Ooh, it's from the Obsidian imprint. I like their type so much better than most of the Berkley Prime Crime titles. I might feed the racoon, but I learned some scary things in biology class... critteranne at yahoo dot com. I wouldn't feed a raccoon because they can have rabbis. I don't think I would feed a raccoon, I've had them living under my deck and I know the damage they can do. Living in the city, you're not suppose to have raccoons in your yard! As much as I love animals I prefer a cat or dog and I do feed the birds outside. 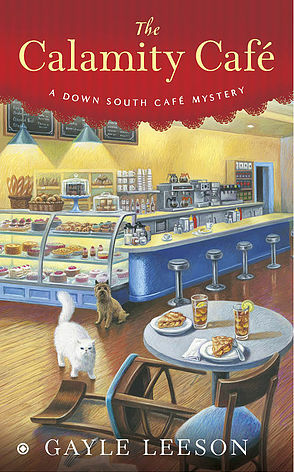 Can't wait to read "The Calamity Cafe". We feed the birds, but squirrels, chipmunks, and raccoons also manage to get into the food. Raccoons are really cute but they can be really destructive so no, I would not feed the little cutie. Unfortunately that is the way with a lot of cute little creatures. Sounds like my kind of hangout and my kind of book!! I can tell already the way this starts out I would enjoy reading it. To answer the question though I'd feed the Raccoon and I love that the character is an older Woman. Please enter me in the contest. I would feed him. Thanks for the great post. I feed all animals that come our way. I look forward to reading this! I'd love to hang out at the cafe.... thank you!